Is Something Paranormal Involved in a Small Child's Language Acquisition? Explaining the origin of language involves the same type of severe difficulties involved in explaining the origin of vision and the origin of flying. In all three of these cases there is the difficulty in explaining the origin of functionality which requires many different parts and a high degree of complexity and coordination before any survival value reward can be produced. In the case of vision, before any survival value reward can be produced, there needs to be a highly complex setup consisting of a preliminary eye, extremely complex biochemistry, at least one highly specialized protein for capturing light, an optic nerve, and very substantial brain changes needed to meaningfully process visual input. In the case of flying, before any survival value reward can be produced, there needs to be a highly complex setup consisting of wings (or a wing-like appendage), and very substantial brain changes needed for either flying or gliding to occur. In the case of language, before any survival value reward can be produced, there needs to be a highly complex setup consisting of changes in the vicinity of the mouth, changes in the brain needed to articulate speech, and changes in the brain needed to process speech spoken by others. We cannot explain the reaching of any of these initial functional thresholds by evoking Darwin's idea of natural selection or survival of the fittest, because there would be no survival benefit until these complex functional thresholds were achieved, each involving a complex arrangement of parts incredibly unlikely to occur by chance. For example, natural selection would presumably not have rewarded some preliminary version of language functionality consisting only of no language-related brain changes, and merely a larynx and pharynx which would have allowed people to only speak as crudely as if they had their mouths filled with rocks. How could changes in the vicinity of the mouth have occurred, in order to enable human speech, presumably before such changes were rewarded by offering an increased survival value? How could changes in the brain have occurred, in order to enable meaningful articulation of speech, presumably before such changes were rewarded by offering an increased survival value? How could changes in the brain have occurred, in order to enable meaningful interpretation of speech spoken by others, presumably before such changes were rewarded by offering an increased survival value? How could any language have come into existence, when it seems that the only way to establish a language (including verbs, grammar rules, adjectives and adverbs) would be if some language already existed? The difficulty of explaining the origin of language is only one of the two great mysteries involving language. A separate difficulty is: how is that very young children are able to learn how to speak a language so quickly? If you are an adult studying a new language, you are instructed in the rules of grammar used by that language. But a small child receives no such instruction, because it is impossible to explain such rules to someone who doesn't already know a language. Instead, a small child seems to pick up language purely by listening to people speak. Consider what a wonder that is. Imagine if you were placed in a remote village in Russia, where no one spoke English, and you had to pick up Russian purely by hearing other people speak it. This seems like an impossible task. It has been extensively argued by leading linguists such as Noam Chomsky that the average young child is not exposed to enough examples for the child to be able to generalize rules of language. This is known as the “poverty of stimulus” argument. The acquisition of a language by very small children seems all the more amazing when we consider that many children raised in bilingual households (such as my two daughters) managed to pick up two different languages before even starting public school, without any formal instruction. To explain the wonder of a small child's language acquisition, some have advanced the idea of a genetically-based language instinct. The idea was popularized by psychologist Steven Pinker in his book The Language Instinct. The idea is that you have some genes that make it easy for you to learn language and grammar. The idea seems to make no sense, because genes are just recipes for making proteins. A gene can only specify a protein that will be used as a building ingredient for the human body. It seems that there is no way for a gene to specify any specific mental ability. Imagining a gene for language understanding seems to be another example of the widespread fallacy of attributing abilities to genes that are beyond their structural limitations. Pinker's claim of a language instinct has been rebutted by Vyvyan Evans, who is actually a professor of linguistics, which Pinker is not. Evans is the author of the book The Language Myth: Why Language Is Not an Instinct. Evans states his views in this essay and this essay. For a Universal Grammar to be hard-wired into the micro-circuitry of the human brain, it would need to be passed on via the genes. But recent research in neurobiology suggests that human DNA just doesn’t have anything like the coding power needed to do this. Our genome has a highly restricted information capacity. A significant amount of our genetic code is taken up with building a nervous system, even before it gets started on anything else. To write something as detailed and specific as knowledge of a putative Universal Grammar inside a human infant’s brain would use up huge informational resources – resources that our DNA just can’t spare. So the basic premise of the language instinct – that such a thing could be transmitted genetically – seems doubtful. This argument is based on capacity, but a similar but better argument would be based on expressive capability. The only thing you can state in DNA or genes are groups of amino acids, the building blocks of proteins. This is an extremely narrow and special-purpose type of expressive capability, as narrow as some minimalist language capable of expressing only sandwich ingredients. Neither genes nor DNA have any broad or general expressive capability of the type that would be needed to state grammatical rules. When I go to the index of The Language Instinct and look up “genes and language,” I find only 16 pages in his 500-page book are trying to present evidence of a genetic link. None of these pages present good evidence that genes give us any language ability. The most relevant evidence presented is a claim that something called Specific Language Impairment “runs in families.” But Evans tells us it “turned out that SLI is really just an inability to process fine auditory details,” undermining Pinker's insinuations that SLI is some evidence of a gene-grammar link. Seeing how meager is the evidence Pinker presents to back up his thesis, we may wonder whether the popularity of his The Language Instinct book mainly stems from his skill as a writer rather than the evidence he has presented. No grammar gene has been found, leaving the idea of a genetically-based language instinct on poor empirical ground. On page 12 of the postscript of a paperback version of The Language Instinct, Steven Pinker says, “Though no single gene specific to grammar has been found (and perhaps none ever will), it is increasingly clear that sets of genes will be tied, with varying degrees of specificity and overlap with other functions, to aspects of language ability.” The latter part of the statement is so hedged and qualified that it is basically meaningless. The important part is the first part of the statement, the admission that no grammar gene has been found, which undermines the whole thesis of The Language Instinct. If the idea of a gene-based language ability is not convincing, in what other ways might we explain the rapid acquisition of language by small children? We may need to go far out of the box, and consider offbeat explanations. Here is an interesting hypothesis. It could be that small children acquire language partially through extrasensory perception (ESP). Humans might be born with an ESP capability that diminishes after early childhood. When you were a child, and your mother or father spoke to you, you might have been able to telepathically know what they were thinking. This may have made it relatively easy for you to learn your first language. Using more advanced training methods, Dr Chuang Chung in Taiwan and Professor Tai-Chun Yang in Sichuan with Lady Tang Kai-Ting have further improved the ability of blind children to ‘see and read’ through skin contact. Some children can now ‘skin read’ the colour, number and figure (animal shapes) on separate cards in some cases at up to 45 cards per minute, often with 100% accuracy. The idea of ESP between family members seems very plausible to me partially because of my own personal experiences. I once played a guessing game with my sister. One person would think of an item around our house, and the other person would try to guess it, after asking a few questions that must be answered “yes” or “no.” As soon as there was a “no” answer, a round was considered a failure. There were at least eight consecutive successful rounds, in which the item was correctly guessed, with the guess preceded by only “yes” answers to the “yes” or “no” questions. My sister and I alternated as the guessers, so it couldn't have been a case of her simply pulling my leg by always answering “Yes.” The odds of getting eight successful rounds in such a game is about 1 in 2 to the twenty-fourth power, or 1 in 16,777,216. I have had equally striking experiences suggesting extrasensory perception between me and my daughters. Here is a different hypothesis to explain the wonder of a small child's language acquisition: it may be relatively easy for a child to pick up language because the child may have reincarnated, and may be remembering language he or she used in a previous life. University of Virginia researchers such as Ian Stevenson and Jim Tucker have done extensive research on alleged reincarnation cases involving children. Many cases have been compiled in which young children seem to report details of the life of someone who previously died, details they could not have known through normal means. When a child reports these accounts that are called “past life memories,” the alleged memories will only persist for a few years. After the age of 10, there is usually no such recollection. Such cases suggest that some children may have been reincarnated. But what if all of us are reincarnated? 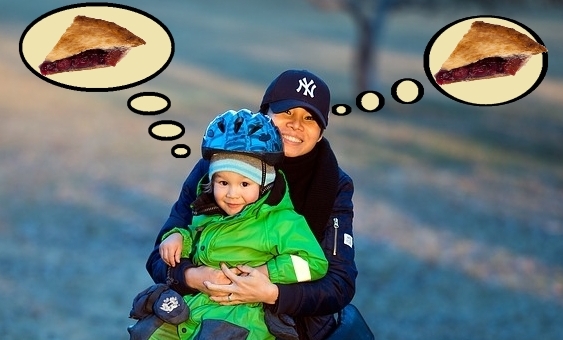 Then it might be that reincarnation plays a key role in a toddler's acquisition of language. In China a toddler may pick up Chinese easily because it lived a previous life as a Chinese person; and in America a child may pick up English easily because he or she lived a previous life as an English-speaking person. Besides being of potential value in explaining language acquisition, the hypothesis of reincarnation might be useful in explaining homosexuality, under the assumption that a homosexual man is a reincarnated person who had a previous life as a woman. As discussed here, existing explanations for homosexuality are very unconvincing. We can roughly think of the idea of morphic resonance like this: there is kind of a global or cosmic information field, which gets added to whenever any natural thing has an experience; and natural things can draw from this information field in a way that makes easier that which might otherwise be very hard. Under such a theory, for example, the first time a spider made a spider web it might have been very, very hard; but all subsequent attempts might be easier; and the more spider webs that had been made, the easier it might be. In this document, Sheldrake claims to have various forms of evidence in support of the theory of morphic resonance. According to the hypothesis of morphic resonance, that which has been learned by many people in the past should be easier for people to learn today. Everyone draws upon and in turn contributes to a collective human memory. The hypothesis of external endowments is the idea that there is some external non-human information facility that gives humans skills that they would not otherwise have. Such a hypothesis may come to mind after you study the history of savants, many of whom have astonishing skills that seem impossible to explain through normal means, often combined with severe mental handicaps. An example of a savant is the late Kim Peek, who could accurately recall the details of 10,000 books he had read, despite having an IQ of only 87. Other examples are Tony DeBlois, who can play 8000 songs from memory, and Derek Paravicini who can play a piece after hearing it only once, despite having a severe learning disability. In the case of savants, it is as if some external agent gave some special endowment to partially make up for the mental handicap. Such a hypothesis may be broadened to cover the case of language acquisition. It may be that every time a small child learns a language, there is assistance from some mysterious external information facility. For a species to come as far as an intelligent, spacefaring alien would have come, they must have figured out a solution to a whole slew of problems that humanity clearly still grapples with. Meeting a civilization such as this could only have positive outcomes for our own. Oh really, Ethan? But what about if visiting extraterrestrials want to conquer us, enslave us, exterminate us, or vastly reduce our numbers, putting the few remaining humans in zoos or reservations? The idea that science backs up the claim of friendly extraterrestrials is rather laughable. Science consists of what we have observed. The only things that are arguably observations of extraterrestrials consist of a wide variety of people reporting alien abductions that were usually not very pleasant. You could argue with just as much force that the empirical evidence suggests we should be afraid of extraterrestrials. If they were hostile to humans, or indifferent to our lives but interested in something present on our world, there might be no way at all to save ourselves. It might be humanity's demise. That's exactly the fear that many among us possess. But is that fear based in reality, and is that a legitimate reason to not send our messages, spacecraft, and information to the stars beyond our reach? Absolutely not. So extraterrestrials might cause our demise, but this is “absolutely not” a reason we should worry about sending out messages announcing our existence, messages that might attract visitors? That doesn't make sense. The possible benefits to humanity of making contact are immeasurable. It would be like receiving a great galactic teacher, advanced thousands of years beyond our own scientific and technological capabilities. It would be the ultimate cultural exchange ever experienced on Earth. There is no logical or scientific basis for concluding that arriving extraterrestrials would be like benevolent teachers. Scientifically speaking, the only evidence we have relevant to such a matter is evidence from history in which visitors from one civilization arrived on distant shores to discover some very different civilization. This has almost never been a pleasant case of benevolent teachers arriving, and has often been a case of the arriving civilization having a deadly impact on the civilization it visited (as in the case of the Conquistadors arriving in Mexico and Peru). Given the age of the universe, if we were to receive benevolent extraterrestrial visitors, it seems likely that they would be so vastly more advanced than us that they would have little interest in playing "great galactic teacher" to us -- just as a tenured college professor has little interest in teaching multiplication tables to little first-grade children. Vastly reducing the human population, freeing up the planet for their own colonization. 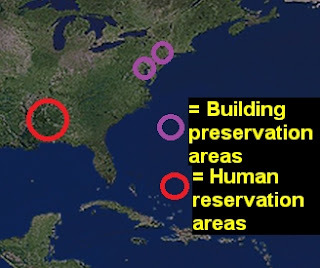 Confining the remaining human population to reservation areas, similar to the Indian reservations set up in the US. Removing most human buildings, preserving a few as historical reminders of the past. 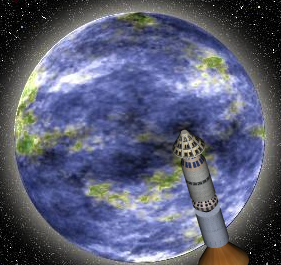 Terra-forming the planet so that it became more like their own planet, which might involve lowering or raising the temperature, or increasing or decreasing the oxygen levels. After they were finished, the map of the eastern United States might look like the one below, with all of the non-circled areas being bulldozed areas reserved for colonization by extraterrestrials. It is widely recognized among scientists that there is a problem called the “replication crisis.” This is the problem that a large fraction of research studies cannot be replicated. The problem was highlighted in a widely cited 2005 paper by John Ioannidis entitled, “Why Most Published Research Findings Are False.” A scientist named C. Glenn Begley and his colleagues tried to reproduce 53 published studies called “ground-breaking.” He asked the scientists who wrote the papers to help, by providing the exact materials to publish the results. Begley and his colleagues were only able to reproduce 6 of the 53 experiments. In 2011 Bayer reported similar results. They tried to reproduce 67 medical studies, and were only able to reproduce them 25 percent of the time. There is a great deal of overconfidence and hubris among many scientists, who often claim to know things they do not at all know. Speaking in triumphal tones, many scientists claim that they, their colleagues, or their predecessors have accomplished things that were not actually accomplished. Many scientists inaccurately describe as “science” or "fact" truth claims or speculations that have not been proven by experiments or observations, claims that are merely philosophical ideas or simply dogmas, stories or speculations that became popular among scientists. In the past and future posts of this blog, you will find discussions of many examples of such things. But for now, let's look at some recent examples. One example is a recent headline from the web site of the publication New Scientist. The headline is: “Kepler finds 219 new exoplanets and 10 are rocky and Earth-like.” But the story doesn't actually discuss the discovery of Earth-like planets; it merely discusses the discovery of Earth-sized planets. The discovery of an Earth-like planet would be the discovery of a planet with life. No such thing has taken place. Another recent example was a FermiLab press release claiming that a new “dark matter map” had been created. But (as discussed here) the map in question was not actually a dark matter map, but a map of mass (something that might be any combination of dark matter and ordinary matter). The technique used to create the map was gravitational lensing, an effect produced by any type of matter, whether dark matter or regular matter. Claiming to have created a map of dark matter based on gravitational lensing is like using an infrared sensor to make a map of human body heat signatures in New York City, and then claiming that you have created a map of Chinese people in New York City. Of course, such a technique cannot distinguish between Chinese and non-Chinese people. By announcing a “dark matter map,” FermiLab was guilty of creating a completely false impression that dark matter had been directly observed. A person hearing such a claim may think immediately of the mystery of what is called the Cambrian Explosion. When we examine the fossil record, we don't see fossils appearing in larger and larger sizes, at an even rate of progression between 3 billion years ago and 100 million years ago. Instead, we see very little fossil evidence of life prior to the Cambrian era about 540 million years ago. But during the Cambrian era there is a sudden surge of fossils in the fossil record. This sudden blossoming of life during the Cambrian era is known as the Cambrian Explosion. This situation is a severe problem for orthodox Darwinism. From Darwinist assumptions, we would expect that the animal phyla would have gradually appeared over the past billion years, with the number of phyla slowly increasing as time passed. But the fossil record shows no such thing. Instead there was a kind of a biological “Big Bang” in which all the major animal phyla appeared rather suddenly. Explaining this problem has been a long-standing problem. Dr Brocks said the extremely high levels of nutrients in the ocean, and cooling of global temperatures to more hospitable levels, created the perfect conditions for the rapid spread of algae. It was the transition from oceans being dominated by bacteria to a world inhabited by more complex life, he said. "These large and nutritious organisms at the base of the food web provided the burst of energy required for the evolution of complex ecosystems, where increasingly large and complex animals, including humans, could thrive on Earth," Dr Brocks said. So this is Dr. Brocks' explanation: there suddenly appeared all of the major animal phyla on planet Earth, the first large animals, because there was some algae available for eating. This is, of course, not an actual explanation. It's like trying to explain 40 different types of monsters rising up out of the ground in your backyard by saying that you were having a barbecue, and monsters like barbecued food. Philosophers distinguish between two types of conditions: necessary conditions and sufficient conditions. A necessary condition for something is a condition that is necessary for that thing to occur or appear, but which does not guarantee that such a thing will occur or appear. A sufficient condition for a thing is a condition which, if satisfied, guarantees that such a thing will occur. You do not explain a thing by merely mentioning a necessary condition of that thing. For example, you would not explain the not-observed appearance of a snowman in your back yard, by pointing out that it's very cold, and snowmen only appear when it is very cold. The existence of algae in the ocean might be a necessary condition for the existence of large complex animals, because that algae might be at the bottom of a food chain used by the animals. But the existence of algae in no sense explains the appearance of large complex animals that the Earth has never seen before. The existence of algae is at best a necessary condition for the Cambrian Explosion, and is not a sufficient condition. The Australian National University press release is therefore guilty of a preposterous misstatement by announcing that this is research that has solved the mystery of how the first animals appeared. It is no sense correct that Dr. Brocks and his colleagues have solved the mystery of how the first animals appeared on Earth, nor have they contributed even 1 per cent towards solving such a mystery. Most people already presumed long ago that algae existed before the first animals, and the previous existence of algae does not explain the existence of such animals, which are many times more complex than algae. The mystery of the Cambrian Explosion remains unsolved. A Cambridge University professor, responding to Brock's claims, says he has gotten things backwards, and that the explosion of algae did not drive the rise of animals. The example we see in this case is not very uncommon. It is sadly true that when reading today's science magazines, one has to be very careful to separate the gold from the dross, the fact from the tribal folklore. Scientists have many great accomplishments to be proud of, so why do many of them seem to be claiming to know things they don't, or claiming that they or their predecessors accomplished things they didn't? It's like some person with $200 million in the bank telling people he's a billionaire. The absolute frequency of positive words increased from 2.0% (1974-80) to 17.5% (2014), a relative increase of 880% over four decades. All 25 individual positive words contributed to the increase, particularly the words “robust,” “novel,” “innovative,” and “unprecedented,” which increased in relative frequency up to 15,000%. This is only in scientific papers themselves; there's a whole other layer of hype going on in university press releases and the press coverage of scientific activities. Call it the "hype crisis." Computer experts have long struggled to achieve artificial intelligence (AI), computers or robots with human-like intelligence. There have been many errors in predictions about when artificial intelligence would appear. Page 12 of the paper here gives a graph showing that 8 experts predicted that computers would have human level intelligence by about the year 2000, and that 8 other experts predicted that computers would have human level intelligence by the year 2020 (something incredibly unlikely to happen in the next few years). Some experts continue to make dubious predictions about artificial intelligence. Some have become what we may call AI alarmists. An AI alarmist is someone who warns us that computers or robots are going to get so smart that a great disaster will occur. Some say that a large fraction of the population will become out of work, as computers or robots take the jobs of bankers, physicians, lawyers, and software developers. Other AI alarmists predict something worse: that machines will become so smart that they take over the planet. Such alarmists often say, “Maybe if we're lucky they'll keep us as pets.” High-tech luminary Elon Musk has said, “A.I. is a fundamental risk to the existence of human civilization, and I don’t think people fully appreciate that.” Stephen Hawking has made similar comments. According to the computationalism theory of the human mind, the mind is like a computer, so one day we will be able to develop computers that produce outputs just like human consciousness. Such a theory is assumed by most AI alarmists. Such theorists usually don't tell us that they are advancing the computationalism theory of the human mind. They usually just pronounce the dubious ideas of such a theory as if such ideas were self-evident. But the computationalism theory of the human mind is not valid. The human mind is not like a computer, and the brain has nothing like these seven things that a computer uses to store and retrieve data. The human mind has facets such as conscious experience and understanding, which have never been produced to any degree by a computer. Let us look into what happens when computers compute. The following equation covers most of the types of computation that occur. Any text can be digitally represented by means of things such as the ASCII system that allows you to represent particular characters as particular numbers. While we don't normally think of an image as digital, it can be represented digitally as a series of pixels or picture elements. For example, a photograph might consist of 1 million pixels, which each can be represented by a number representing a particular shade of color. So the image can be digitally represented by a million such numbers. A video can also be representing digitally, since the video can be represented as a series of images, each of which can be digitally represented. But there are some things that we can never hope to produce as digital outputs. The first is real conceptual understanding. By understanding I don't mean “how-to” type understanding, but the high-level conscious understanding of some abstract truth or concept. We can imagine no possible way to produce a digital output that would equal a real conceptual understanding of something. But, you may ask, doesn't that smart computer Watson already understand something – the game of chess? No, it doesn't. Watson merely can produce a digital output corresponding to a good move to make as the next move in a chess game. Watson has zero conceptual understanding of the game of chess itself, and has zero understanding of the abstract concept of a game. The only way you can understand the abstract concept of a game (or the abstract concept of leisure) is if you have been a human being (or something like a human), and played a game yourself. A digital output must always boil down to a series of 1's and 0's. Can we imagine a series of 1's and 0's that would equal a real understanding of an abstract concept such as health, matter, life or world peace? No, we cannot. AI alarmism is based on the idea that future computers will be able to produce conceptual understanding as an output. They won't, because real understanding of abstract concepts is not a possible digital output, and digital computers will only be able to produce digital outputs. Computers or robots lacking conceptual understanding will neither be able to take over the world nor even ably perform any of the more intellectually demanding jobs requiring the repeated application of general intelligence. But why do computers sometimes seem smart? Because by programming software and putting that into a computer, a computer can act as a repository of human logic. 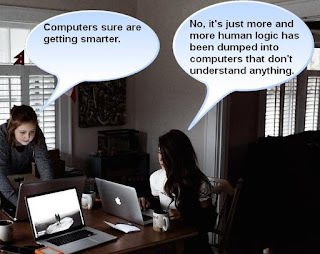 But the logic used by the computer is not coming from the computer, but from some human who programmed the computer. The process of encoding human logic and transferring human logic to a computer is relatively slow and laborious, only allowing the simulation of very limited types of expertise. There seems to be no hope that clever humans will ever be able to create some kind of general intelligence program that thinks and analyzes in the general-purpose way that humans do. But we know that the brain produces understanding, and the brain is a material thing. Once we understand the exact material factors involved in how the brain produces understanding, we need merely ramp up such physical processes in a robot or a computer, multiplying such processes many-fold; and then you'll have something that greatly exceeds us in intelligence and understanding. I deny that we know any such thing as what is stated in the first sentence of this argument. Nature never told us that our thoughts and ideas are coming from our brains. The idea that the understanding of the human mind is produced by the brain is an unproven dogma – something very often asserted, but never proven. Such a dogma is certainly not proven by brain imaging studies, which merely show very unimpressive differences in blood flow to different parts of the brain, typically only 1 or 2 percent (see here for the flaws of brain imaging studies). Below are eight reasons for doubting that human understanding is merely a product of the brain. No one has any real understanding of how neurons or any other brain parts could produce consciousness, ideas or understanding. As documented by physician John Lorber and others, and as discussed here, there are numerous cases in the medical literature of people who maintained normal or almost normal consciousness and understanding, even though very large parts of their brains were destroyed or ruined by disease or injury. The mammal dissection experiments carried out over many years by Karl Lashley showed surprisingly high mental functionality when large portions of animal brains were removed, including large fractions of the cortex. As argued here, the human mind has quite a few fundamental traits that we cannot explain as being caused by natural selection, because they don't provide survival value; and this undermines the prospects of explaining our minds as some material effect. The human mind occasionally displays psychic powers (as demonstrated here and here) that cannot be accounted for through brain activity. During near-death-experiences there have been numerous cases of people who reported floating out of their bodies during cardiac arrest, and often correctly reported details during a time when they should have been unconscious. Claims that understanding comes from the brain (or more specifically the brain cortex) are in conflict with tests showing very high mental functioning and apparent high understanding in animals such as crows, who have no cortex and tiny brains. Human memory is still supremely mysterious, and we have no understanding of how brains could be achieving the 50-year memories that humans demonstrate, or the instantaneous recall of memories that humans have. Despite the dogma that memories are stored in brains, there is no plausible neural explanation as to how an organic system like the brain could be the source of memory storage as long-lasting as humans have, or the source of memory recall as instantaneous as humans have. All of these things suggest an idea much more logical than the “we are thinking meat” dogma of materialists: the idea that we are thinking souls who happen to be hanging around in bodies. Because this idea is highly viable, we do not at all know that understanding is something that is materially produced by human brains. Not knowing such a thing, we can have no confidence that some “trick of matter producing mind” will ever be uncovered by future scientists. If you are “thinking meat,” then you might have a grave fear that maybe the secret of a “meat-to-mind” trick might be learned by computer makers, who might be able to amp up such a trick a thousand-fold, to produce robots and computers so smart that they take over all jobs such as yours, or take over the world. But in light of the eight things discussed above, a more logical idea is: there is no such “meat-to-mind” trick for us to ever discover, because the meat in our brains is not producing our minds. In that case, we need not fear very much robots or computers, because they simply will never be able to have any bit of the understanding we have. Computers or robots lacking any real understanding will not be able to perform any of the more intellectually demanding jobs, those that require real conceptual understanding. And such robots and computers will not be able to take over the world, having no actual understanding of our planet or even a thousand simpler things. Postscript: See here and here for two long recent articles in the online Psi Encyclopedia documenting experimental evidence for human paranormal abilities, abilities that conflict with conventional dogmas that mental activity is merely the product of the brain. The articles have many references to published research. The link here takes you to many similar articles in the Psi Encyclopedia. Earlier this year, Scientific American published a blistering critique of the theory of cosmic inflation originally advanced by Alan Guth (not to be confused with the more general Big Bang theory). The theory of cosmic inflation (which arose in 1980) is a kind of baroque add-on to the Big Bang theory that arose decades earlier. The Big Bang theory asserts the very general idea that the universe began suddenly in a state of incredible density, perhaps the infinite density called a singularity; and that the universe has been expanding ever since. The cosmic inflation theory makes a claim about less than one second of this expansion – that during only the first second of the expansion, there was a special super-fast type of expansion called exponential expansion. The article in Scientific American criticizing the theory of cosmic inflation was by three scientists (Anna Ijjas, Paul J. Steinhardt, Abraham Loeb), one a Harvard professor and another a Princeton professor. It was filled with very good points that should be read by anyone curious about the claims of the cosmic inflation theory. But now the article has been half-censored, for Scientific American has put the article behind a paywall. But don't worry, you can still read the article on a Harvard web site here. Or you can go to this site by the article's authors, summarizing their critique of the cosmic inflation theory. The Scientific American article by the three scientists provoked an unusual response. The main supporters of cosmic inflation theory (including Alan Guth and Andrei Linde) along with about 30 other cosmologists have published a rebuttal article called “A Cosmic Controversy.” It is kind of an authoritarian power play, designed to impress the reader by listing authorship by some of the top names in cosmology. The list of authors is very impressive, but there are some factually inaccurate claims in the article. The article claims that the cosmic inflation theory has been empirically successful. Referring to variations of the theory called slow-roll models, Guth claims that “many models in this class continue to be very successful empirically,” and later refers to “the dramatic observational successes of inflation.” These claims are not accurate. The cosmic inflation theory makes two main claims: (1) that there is or was something called an inflaton field; (2) that the universe underwent a period of exponential expansion during part of its first second. Various versions of the cosmic inflation theory have also claimed that there exist or once existed other universes (sometimes called “bubble universes”), or that something called grand unification theories (GUT theories) are in some sense correct. We have not a single observation verifying any of these claims. The claim that the universe underwent an exponential expansion during part of its first second is one that can never be confirmed, because of physical limitations (the recombination era issue) that will always prevent us from looking back to the universe’s first second with our telescopes. No evidence has been produced for this so-called inflaton field, and it has not been detected by the Large Hadron Collider. No evidence has been produced that there is any universe other than our own, and there are very strong reasons for thinking that no such evidence ever could be produced (anything that we might observe would always be an observation of our universe, not some other universe). No evidence has turned up for the idea of grand unification theories (GUTs), which have been one of the more embarrassing failures of modern physics. Given this situation, in which not a single one of its key claims has been backed up by observations, it is pure baloney for Guth and his allies to be calling their theory an empirical success. Their claim is based on the very shaky idea that various versions of cosmic inflation theory have made some predictions about a few things that have been consistent with observed reality. In my post here I give several paragraphs explaining why this type of claiming success based on imprecise general predictions is fallacious. Among the reasons I gave is that there are very many versions of the cosmic inflation theory (each predicting a wide range of things, as each version allows a range of input parameters); so even if the theory is bunk we should not be surprised if some of the resulting predictions matched reality. Let us suppose that some theory claimed that green monsters from Alpha Centauri have landed on our planet and invested in the bond market; consequently next year the bond market will go up and the stock market will go down. 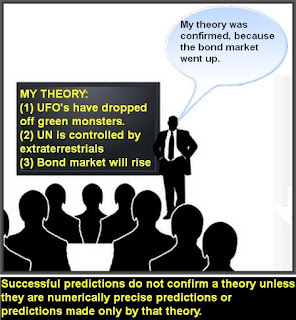 If next year the bond market did go up and the stock market did go down, it would still not at all be accurate to claim that this weird theory was empirically successful. It would only be correct to say that if the green monsters were actually observed. Similarly, no theory of cosmic inflation can be called empirically successful until one of its core central claims (unique to the theory) has been observed. No such thing has happened. There is another huge reason why the cosmic inflation theory cannot be called empirically successful. The reason is that the theory is inconsistent with observations of anomalies in the cosmic background radiation (also called the cosmic microwave background, or CMB). Believed to date from early in the universe, the cosmic background radiation is a type of radiation pervading all of space. The cosmic inflation theory predicts that this radiation should be very smooth and isotropic (just as the theory that your friend spent 20 minutes stirring his bowl of pancake batter predicts that the pancake batter should be very smooth, and without lumps). The p-values here give us a rough idea of the probability of finding such anomalies if standard ideas of cosmology (including cosmic inflation and dark matter) are correct. This all presents a huge problem for cosmic inflation theorists such as Guth. These are all things that we should not expect to be finding in the cosmic background radiation if the cosmic inflation theory is correct. Years after the WMAP satellite was launched, scientists launched another satellite called the Planck satellite. It was predicted that the troubling anomalies in the cosmic background radiation would go away after the more powerful Planck satellite did its work. But that did not happen. The Planck team reported the same anomalies. 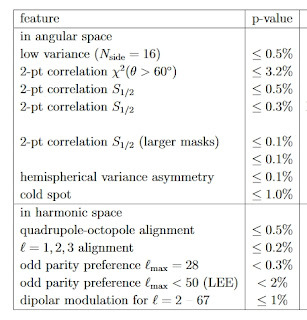 The table above is from a paper entitled, “CMB Anomalies After Planck.” When the Planck team reported its results on these anomalies, they buried their findings in a dense technical document, as if they were trying to make it as hard as possible for anyone to discover the truth about this matter. But the “CMB Anomalies After Planck” paper gives us some of the straight talk that the Planck paper lacked. Measurements of CMB temperature fluctuations by the Wilkinson Microwave Anisotropy Probe (WMAP) indicate that the fluctuation amplitude in one half of the sky differs from the amplitude in the other half. We show that such an asymmetry cannot be generated during single-field slow-roll inflation without violating constraints to the homogeneity of the Universe. But this “slow-roll” version of the inflation theory is the very one that Guth called “very successful empirically” in his Scientific American article. Apparently it is no such thing. While not all of these alignments are statistically independent, their combined statistical significance is certainly greater than their individual significances. For example, given their mutual alignments, the conditional probability of the four normals lying so close to the ecliptic, is less than 2%; the combined probability of the four normals being both so aligned with each other and so close to the ecliptic is less than 0.4% × 2% = 0.008%. These are therefore clearly surprising, highly statistically significant anomalies — unexpected in the standard inflationary theory and the accepted cosmological model. This is a probability of less than 1 in 10,000 under the assumptions of the cosmic inflation theory and the accepted cosmological model. That's hardly what we would find if the cosmic inflation theory really was “empirically successful” as Guth claims. During the epoch that the CMB anisotropies were formed, they too are supposed to, on average look the same in every direction. The theory of cosmic inflation generically predicts this feature. This means that if one divides the sky into two arbitrary hemispheres, we should see the same statistical features of the anisotropies in both hemispheres. However, both WMAP and Planck see a difference in the amount of anisotropies in different hemispheres in the sky. This feature is in tension [with] one of the most powerful attributes of inflation, whose rapid expansion of space-time smooths out any large-scale directional preference, while democratically sprinkling the space-time fabric with the same amount of ripples in every direction. With some decorative tweaking, it is possible to modify inflation to account for the anomaly, but this seems to be at odds with what inflation was invented for-to make the early universe smooth enough and see the tiny anisotropies that later become galaxies. One might think that this would be a great opportunity for alternative theories of the early universe, such as bouncing/cyclic cosmologies to rise to the occasion and explain the anomalies, but so far, there is no compelling alternative. By suggesting that it may be time for “alternative theories of the early universe,” Alexander is clearly suggesting these CMB anomalies are in conflict with the cosmic inflation theory. Contrary to the claims of Guth and his clique, the cosmic inflation theory is not empirically successful. It has enjoyed another type of success: sociological success. The history of modern science culture shows repeatedly that a theory that is not empirically successful may become sociologically successful and become popular due to a bandwagon effect and groupthink. Once this snowball effect gets rolling, the theory may become a speech custom of an insular academic subculture, and a little piece of tribal folklore has been born. The adherents of the theory will in effect place gold medals around their own necks, congratulating themselves on what they think is their brilliant explanatory triumph. But such gold medals may be very undeserved. Particularly puzzling are the alignments with solar system features. CMB anisotropy should clearly not be correlated with our local habitat. While the observed correlations seem to hint that there is contamination by a foreground or perhaps by the scanning strategy of the telescope, closer inspection reveals that there is no obvious way to explain the observed correlations. But when you look at CMB map, you also see that the structure that is observed, is in fact, in a weird way, correlated with the plane of the earth around the sun. Is this Copernicus coming back to haunt us? That's crazy. We're looking out at the whole universe. There's no way there should be a correlation of structure with our motion of the earth around the sun — the plane of the earth around the sun — the ecliptic. That would say we are truly the center of the universe. The new results are either telling us that all of science is wrong and we're the center of the universe, or maybe the data is simply incorrect, or maybe it's telling us there's something weird about the microwave background results and that maybe, maybe there's something wrong with our theories on the larger scales. There is a small band of cosmology-following geocentrists who believe that the Earth is the center of the universe, and that this quadrupole – octopole alignment supports their claim. But we know the earth revolves around the sun. A less outrageous claim would be that the solar system may be somehow in some kind of privileged position, and that the quadrupole – octopole alignment supports this claim. It would be premature to make even this less outrageous claim based on this limited evidence. But it is interesting that this quadrupole – octopole alignment may suggest one of the key assumptions of modern cosmology (the Copernican principle, that there is nothing special about the position of the solar system) may be wrong. Postscript: For more information on this topic, do a Google search for "lopsided universe," "axis of evil (cosmology)", "CMB cold spot," and "CMB anomalies." 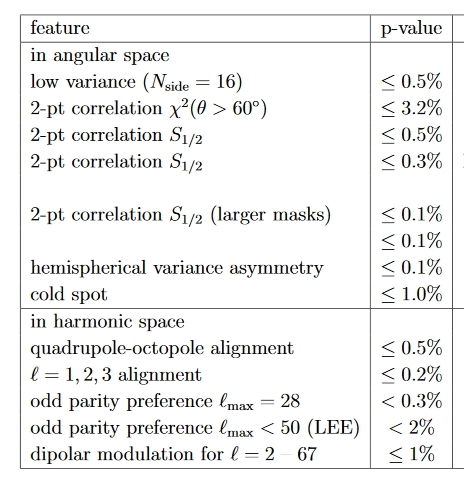 In a previous post I had mentioned the cold spot as a thorn in the side of cosmic inflation theory, but from the table above it is clear that the hemispherical variance asymmetry is a ten times bigger problem for that theory. It is this abundance of useless models that gives rise to the criticism that inflation is not a scientific theory. And on that account, the criticism is justified. It’s not good scientific practice. It is a practice that, to say it bluntly, has become commonplace because it results in papers, not because it advances science.